On this episode, Diana Nguyen speaks to fellow reporters Sally Beauvais and Carlos Morales about the zero-tolerance policy, family separation, and the path to reunification. The story of family separation at the southwest border goes back to at least April, when U.S. Attorney General Jeff Sessions announced the administration’s “zero tolerance” policy. This was the administration’s effort to begin criminally prosecuting all cases of illegal entry into the U.S. When these criminal prosecutions began happening it led to thousands of kids being separated from their parents. Between April and May of this year, the Department of Justice estimated that about 2,500 migrant children had been separated from their parents. In the past, migrants weren’t always being prosecuted to the full extent of the law. They were often handed right over to immigration authorities rather than be criminally charged. So when the Trump administration’s “zero tolerance” order went into effect, we began seeing migrants referred to criminal prosecution, which means they were sent to a federal jail. As a result, an increasing number of migrant children were separated from parents, because detainees can’t be kept with their children in criminal facilities. The kids began filling up space in shelters across the country, which paved the way for the establishment of temporary shelters. This week, reporters were allowed to tour the Tornillo facility, where more than 300 migrant children are being held, according to a spokesperson from the Department of Health and Human Services. Most of them are from Honduras, El Salvador, and Guatemala. Twenty-three of the kids there were separated from their parents at the border. Additionally, there are now 14 migrant girls being sheltered there, ages 13- 17. According to multiple reports, the contractor in charge of the tent encampment fought off pressure from U.S. officials to move forward with a move that would’ve increased the Tornillo shelter space up to 4,000. The contract for the facility ends on July 13, which means the shelter could close then. But while that site is slated to shutter, the government does have new spaces lined up. The Department of Defense has confirmed that migrant families will soon be housed at Fort Bliss in El Paso. They will also use the Goodfellow Air Force Base near San Angelo as a shelter for children. Several of the agencies involved in the reunification process — like the Department of Homeland Security and HHS — have said they’ve created a process to ensure that family members know the location of their children. And on Capitol Hill this week, HHS secretary Secretary Alex Azar told lawmakers that parents should be able to find their children easily. But migrant parents continue to tell a different story. Some parents who have dialed a 1-800 number set up by these government agencies to help locate children have said they had difficulty getting through. And in some cases, parents that get through say they have still had trouble tracking their children. 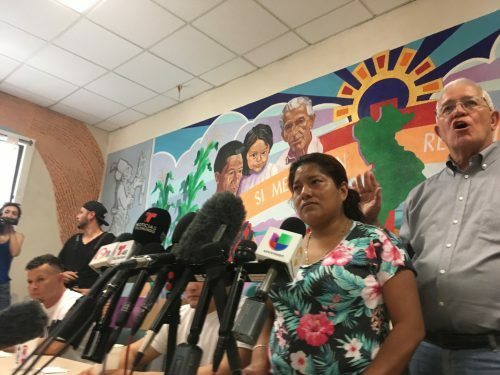 Miriam, a mother who was a part of a group of migrant parents just released to a shelter in El Paso, told reporters she was finally able to track her son to a shelter in New York. But it took a week, she said, to find out where he was located. If a parent is lucky, they’ll have found someone like Linda Rivas who can provide assistance in locating their child. She runs a legal aid clinic for immigrants and refugees in El Paso. Rivas has been meeting with clients in detention in the El Paso area to screen them for legal benefits and to see if they qualify for asylum. But apart from preparing to represent these clients in immigration court, she also helps search for the separated children. When Rivas starts tracking down migrant children, she starts by making contact with local legal offices and shelters that serve migrant kids to try and make a match locally in El Paso. But she’s increasingly finding that these migrant children are held nearby. So then she contacts ICE and ORR to try and locate the child. She says that process can take a while and then, if and when they do locate the child, the reunification process is a whole other procedure, involving getting documentation to prove the familial relationship. Rivas says she often has to act as the go-between for different government organizations. In one case where she was trying to reunify a mother and child, ORR said they needed the mother’s passport to move forward. In the environment of family separation, reunification — however long and convoluted the process may be — suggests a moment of physical reunification between parent and child. But according to Melissa Lopez, an immigration attorney in El Paso, the legal definition of reunification is not necessarily that. She says it’s the process by which a child who was in U.S. custody is released from U.S. custody. “So in in the in the child detention system on the immigration side, a child can be released to either a family member or a family friend. So it’s not always necessarily a family member. It may be, you know, an uncle as we would refer to it commonly in the Hispanic culture but not necessarily a blood relative. But just somebody who’s a longtime family friend and trusted. But yet doesn’t necessarily have to be a family member or a parent per se.” – Melissa Lopez, immigration attorney. When they are released, migrant children may go with a family friend or sponsor who’s been vetted to be qualified to care for the child. And according to some federal attorneys, that could be a good scenario for families fleeing violence. To some parents, it might be a positive thing if their kids get to stay in the states, even if they themselves have been deported. There are currently several entities suing the Trump Administration over family separation. This week, a California court ruled the Trump administration must reunite families within a certain amount of time. Under the order, the U.S. government is tasked with reuniting children under the age of 5 with their parents within 14 days. The other kids who’ve been separated from their parents must be reunited within 30 days. For now, the Trump administration must figure out how to accomplish this — efficiently. This entry was posted in and tagged Border, Immigration. Bookmark the permalink.